Sometime it is hard for us not to become complacent over time. Complacency is a true killer or personal creativity. But the question remains, how do we avoid the dreadful problem altogether? The answers are many, and most of them are very easy. One simple step is to visit new locations. Nothing gets a photographers mind working more than a brand new location to decipher and reorganize in their own way. I am not talking about going across the country or half way around the world. I'm thinking 100 miles might bring you to a location that is very much new to you. If you want to go a bit further then check out a neighboring state, I guarantee it will offer some wildly new scenery. Another simple step, perhaps not cheap, is to work with a new piece of equipment. This might be a $100 four foot folding reflector for highlighting elements in the foreground. Or maybe you have been looking to break the bank on something special, say the Nikon 14-24 F2.8G ED lens. Regardless, new equipment can give you a great excuse to escape into the woods and test the new gear. And maybe it isn't gear altogether, perhaps it is a technique that you have never tried and want to test it out (this is a massive motivator for me). The last option I want to mention is the easiest and perhaps the most helpful. Bring someone with you. I often enjoy shooting alone because I occasionally feel guilty for taking so much time running around looking for something when I'm not sure what I'm looking for. However, if you can find a like minded individual, then a lot more options become available. Having another photographer come along can help push you. As can you help push them towards discovering new levels of passion and skill. Rising early in the morning and staying out very late can also be more enjoyable with a fellow friend. 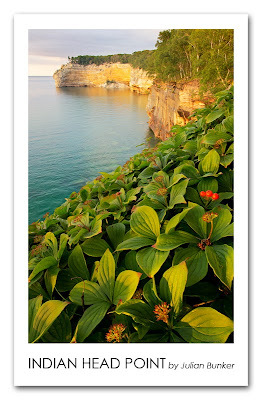 About the photograph above: As the title suggests, The cliff face featured in this image is named "Indian Head Point.' Indian Head Point is in the Pictured Rocks NLS or Michigan's Upper Peninsula. The cliff is one of the most beautiful peninsulas in the whole park. I wanted to capture the cliff near sunset with green foliage filling the bottom of the frame. An extremely precarious perch was needed to achieve the angle of view I wished for. Once I had the shot composed I noticed after checking for complete focus that the scene wold be impossible to capture in focus in a single photograph. So I decided to take three different images at different focus areas and later combined them in PS. I also needed to take an additional, slightly darker, shot focused near the horizon for the bright clouds and sky. If anyone has questions about this technique, which is quite simple, they can be sent to my e-mail jbphotography2@yahoo.com. Technical details: Canon 6D, Nikon 14-24 F2.8G ED lens (@18mm), Novoflex Adapter - Nikon G Lens to Canon DSLR Body. ISO 100, F/16 for all four images images, Three focus bend shots 1/2 of a second exposure, for the highlights in the cloud and sky 1/5th of a second exposure.